Kate Elliot, Spirit Gate, Crossroads Book 1, Orbit. Published 2007. I have not read any Kate Elliot before and picked this book up on impulse, seeing that great cover, a great teaser page and the Orbit tagline. People that ride eagles and serve justice? Very very cool. ‘The Guardians’ a mysterious and magical race? Cool. A fanatical, evil and magical army, hiding from justice? Also very cool. Strong and diverse female characters? Nice one. This is high up on my list for a must-read. Elliot races through the plot and leaves you wanting more. She introduces a whole new world and set of characters part way into the book. I was a bit annoyed at first with the sudden scene change, but it quickly drew me in with its characters and Chinese/Warlordian parallels. Now, I am eagerly awaiting my copy of Shadow Gate to arrive. Check out her blog, some interesting musings, enough to get lost in for an hour or so? (The UK cover, above, is so much better than the US/Aus cover, below). I bought this book based on your recommendation, and I’ll read it soon. You made it sound good! 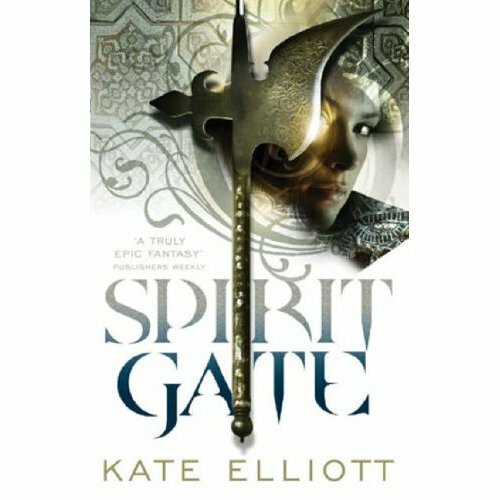 Well I recently bought Spirit Gate, it’s next in the reading queue, I’m going back through George RR at the moment! Getting ready for April are you? Can you believe it’s been postponed again! 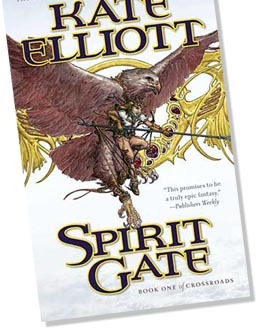 I just got Spirit Gate recently, much for the same reason–Orbit always has amazing covers, teasers, and taglines! I have a few others to get through first (Russell Kirkpatrick) but it’s in the stacks..
Yep I love Orbit too. I haven’t read any Kirkpatrick… any suggestions for where to start?